Week 15 of the Winter/Spring 2009 TV Season has arrived. A very light lineup but there are a few so read on for all of the details. The Cougar (10pm on TV Land) A new reality TV series on TVLand with Vivicai A. Fox. Please stop the realityTV nonsense. Pretty please. Pitchmen (10pm on Discovery) A new reality series on Discovery. Definitely not on my list of shows to record. 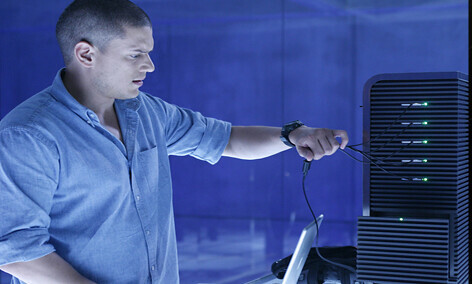 Prison Break (8pm on Fox - avail in HD) - The "spring" premiere of Prison Break on Fox. Grey Gardens (8pm on HBO - avail in HD) - An HBO original film starring Drew Barrymore and Jessica Lange. That’s it for this week. Stay tuned for a few more premieres which you’ll find on GeekTonic this coming Sunday morning and each week on Sundays. New shows still on the way including: "Sit Down, Shut Up" on Fox, "Law & Order: Criminal Intent" on USA, and "In Plain Sight" on USA. After that we'll be into the Summer seasons - I'm working on the Summer TV Premiere List that should be ready in the next few weeks. Most interesting new show from last week? My vote goes to "Harper's Island." It has a compelling mystery, a little blood and even a little novella-kind of story that makes it something quite different than the normal fare on TV. I also checked out "The Unusuals" which was decent, but it better get more interesting or I'll have to throw it out - I still can't get over them using this show to replace "Life on Mars." The final premiere I watched was "Parks and Recreation" with Amy Poehler - an Office kind of offshoot that was okay, but not funny enough to keep my interest. Parks and Recreation might be removed from my SageTV favorites pretty quickly unless it gets better fast. I haven't watched "Southland" yet - anyone else check it out yet?